ANCOATS - to anyone familiar with this old industrial district of Manchester - this is a name which conjures up many images - smoke, factories, grime, chimneys, "dark satanic mills", murky canals, red brick warehouses, the clatter of machines, the glow of furnaces, the wail of the mill siren - , a grey, dismal world filled with poverty and pollution and laden with the atmosphere of the 19th century. And yet there was much that was good in old Ancoats: in the streets of tiny terraced houses, there was a strong sense of community - as well as the local English population, there were many migrants from other lands, including Poland, Ireland and Italy. On a Saturday night, pubs such as the Shamrock and the Edinburgh Castle must have been welcoming places, full of singing and carousing, though outside, many local residents enjoyed fighting - especially the Irish. But after a raucous weekend Monday morning Ancoats must have been a depressing place, the wail of the factory siren summoning you to another week of toil in the factory. Today the mills are quiet, the windows boarded up, the workers mostly gone. Ancoats has had its day, some may say, and as we enter the 21st century, why save a group of rotting old mill buildings? Better to tear them down and build a nice new modern trading estate in their place. This actually happened a little further down Great Ancoats Street, where a group of white prefabricated structures housing some well-known retail chains obscures the grand old mills beyond. Luckily, no more prefab trading estates are to be built, and the heart of Ancoats has been saved from demolition. The buildings currently look delapidated, but two hundred years ago, the mills of Ancoats were the future, symbolic of the onset of the urban Industrial Revolution, attracting attention from all over the Kingdom - and the world. Ancoats has the distinction of being the first industrial suburb in the world - No other location, say in Yorkshire or the Midlands, can lay claim this - and that's why it's been saved for the future. 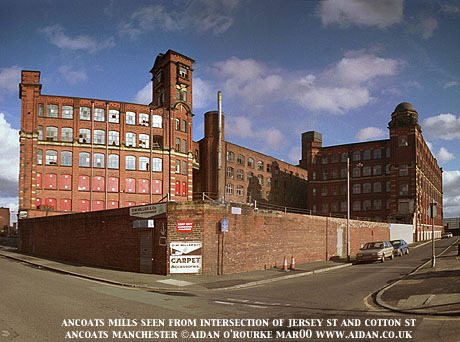 It's also been said that the mills of Ancoats were used as the model for similar buildings in the United States. Can anyone confirm this? At the moment, the revitalisation of Ancoats is only beginning. The mills look solid enough on the exterior, but inside they're at an advanced stage of decay, and have only been saved from demolition by the efforts of an organisation based in one of the few mills in Ancoats to have been renovated already. It's the Beehive Mill on Jersey Street. As you approach, you hear the sound of drums and electric guitars - this is the place where many of Manchester's band rehearse and record. On the roof there's a sign saying Sankey's Soap - not a soap factory but a night club which may shortly re-open. There's a snack bar on the ground floor, and upstairs are the offices of three important organisations, each of them playing a key role in the redevelopment of Manchester: Eastside Regeneration, The Ancoats Urban Village Company, and The Ancoats Buildings Preservation Trust. Eastside Regeneration is concerned with the economic revival of the east side of Manchester, The Ancoats Urban Village Company is charged with revitalising Ancoats and turning it into a living community. And it's the Ancoats Buildings Preservation Trust which has succeeded in saving a number of the buildings of Ancoats, and it hopes to save more. The historical district of Ancoats extends from Oldham Road, along Great Ancoats Street and down as far as the Ashton Canal and Pollard Street. But the Ancoats conservation area is restricted to a smaller rectangle, ending at the Rochdale Canal to the south and Wadeford Close to the east. Within this area these organisations have the goal of turning a half-derelict area of old industrial buildings and temporary car parks into a living, breathing community, similar in some ways to Castlefield, but supporting a residential population of mixed income levels who both live and work in the area. It's a tall order, but given time, and financial support, it should eventually come true. Let's take a walk around Ancoats and take a look at what's there now, what was there in the past and how it's likely to look in the future. Opposite the Beehive Mill is a group of mills known as the Murray Mills complex, the oldest in Ancoats, dating from 1798, and the oldest steam driven mill in the world. You'll notice the windows of Jersey Mill have multi-colour boards - these aren't just for decoration - they were installed by the Ancoats Buildings Preservation Trust to protect the fabric of the building until renovation starts - air vents allow air to circulate but defend against the three main enemies of unoccupied buildings: rain, pigeons and arsonists. Other windows are smashed or bricked up - their delapidated state speaks volumes about the passing of time and of the decay that has descended on this area. 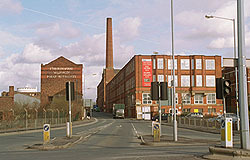 These mills dominate the view along Redhill Street, overlooking the Rochdale Canal and can be seen from the southern part of Great Ancoats Street - this is the quintessential view of Ancoats. Let's walk from the Rochdale Canal through Ancoats up to Oldham Street. Next to Murray Mill is the Royal Mill complex, part of it built as recently as 1912, on the site of McConnell & Kennedy's, which was first constructed on this site in 1794. In these buildings huge, deafening machines manufactured fine cotton up till around the middle of the 20th century. An alcove on the south west side commemorates the visit of the King and Queen during World War Two. Production ceased in the post WW2 years with the decline of the cotton industry and the buildings were vacated. Many of the windows of the magnificent Paragon Mill are still open to the atmosphere and the structure is far from secure. I can imagine these buildings as apartments - I particularly fancy having my rooftop 'eyrie' in the tower at the top, with a 360 degree webcam surveying the scene - and I'm not the only one interested in this property. Unfortunately, any developer will have to reckon with structural renovation work running costing millions of pounds. Preserving the past is an expensive business. We're now on Jersey Street, which divides the industrial and residential areas of Ancoats. Next to the electricity substation are two houses, one of which is still inhabited. Further up Jersey Street is the Beehive Mill and beyond Radium St some industrial buildings which are still in use. It's hoped that in the new Ancoats, these businesses will stay, providing jobs for local residents. Radium St by the way, was formerly German St but was renamed during the First World War due to anti-German sentiment, and to commemorate medical advances being made at the Holt Radium Institute at Christie Hospital. Over to the left we see the centre piece of Ancoats and the Ancoats Buildings Preservation Trust's most ambitious restoration project yet, the renovation of St Peter's Church. This was built in 1859 and served the then vibrant local community. Eventually the congregation faded away and the church lay derelict for many years. Now the slate roof of the tower has been put back, and the exterior brickwork has been cleaned up and secured. But inside it's an empty shell, there isn't even a floor. To bring St Peters from the brink of collapse to the secure, but still unusable state it's in now, cost over £1m. Yes, conservation isn't cheap, but provides a better investment for the future than those flimsy prefab industrial units down Great Ancoats Street. It's hoped St Peters will eventually re-open as a cultural or community centre, but just like the Monastery of St Francis in Gorton, not as a church. Facing St Peters are the buildings which form the residential part of Ancoats - the Victoria Square dwellings were among the first municipal housing projects to be built in the UK. And adjacent to them is George Leigh Street, a pleasant row of terraced houses - providing a homely feel in the heart of the city. This area was resurfaced in early 2000 - the light coloured pavings aren't to the liking of some people. The nearby red brick multi-storey car park is also somewhat out of character with the surroundings. If we keep walking along Sherratt St, we reach Oldham Road. Continue north and you'll find the only remaining 'back to back' houses in Manchester - you have to look hard, they're practically falling down and have been extensively modified. Across Oldham Road was the church of St Paul's, with its distinctive tower it's said the bell used to ring to wake up the workers of the Angel Meadow district just beyond. It was demolished in the early 1960's. The corner of Great Ancoats Street and Oldham Street is an interesting, though currently run-down spot - It's known historically as New Cross - I'm not sure of the explanation for this - any suggestions? From here we can see the former Daily Express building - a remarkably modern-looking glass-walled structure built during the 1930's. There's a matching building on Fleet St in London. Just next to it is the first building to be rescued by the Ancoats Buildings Preservation Trust, the Derros building, famous as the subject of an illustration by LS Lowry. Lowry must have been inspired by other areas of Ancoats, which in his day saw much poverty. Walking further down Great Ancoats Street, we see a series of commercial buildings, mostly empty and in a very run-down state. There are gaps where buildings have been lost, but others, currently empty, have been saved and are in 'storage', awaiting a new future use. We're back at the canal again and with the noise of cars, buses, vans and HGV's rushing by behind us, let's take another look towards that quintessential scene of Ancoats and try to imagine what it must have been like during its heyday: In my mind's eye, I see barges chugging along the canal carrying goods, smoke belching from the chimneys, match sellers on the street corners, the clatter of horses and carts on the cobblestoned streets, and as night falls, the dim light of the gas lanterns. But what will we see here in the future? According to current plans, Ancoats is set join other revitalised former industrial areas of Manchester, and be given a total make-over: the mills will be cleaned up, renovated and converted into apartments, offices and other uses; new structures will probably appear where there are currently car parks; shops, cafes, bars and amenities should open as people start to move in again. A public open space is planned for the square in front of St Peters - this was originally planned as an Italian-style piazza, but the plans have changed. A new apartment complex is to be built on the empty site opposite the Victoria Square dwellings. Maybe the patter of little feet will be heard again, once there's a big enough population to support a primary school. I just hope that Ancoats won't become a rich person's ghetto, as certain parts of the centre are becoming, and will retain a healthy mix of people from different backgrounds. And I hope even in the age of the ever more sophisticated personal computer, people won't forget the old Ancoats, part of the grey, grimy Manchester I remember from my earliest childhood. Well, that's all from Ancoats - join me again in ten years time and we'll see if my predictions have come true. And for a taste of old Ancoats, look at the drawings and paintings of LS Lowry, which are (or soon will be) on show at the Lowry Centre, in Salford Quays. You can also go to the Central Library and view pictures from their archives.